shortly after Sandawa Traffic light. Davao City skyline will never be the same again with the coming of another posh 5-tower landmark along McArthur Highway in Matina. Cebu Landmasters, Inc. a leading real estate developer based in Cebu City has recently inked a joint venture agreement for Yuson Huang Excellence Soberano, Inc. (YHES, Inc.). 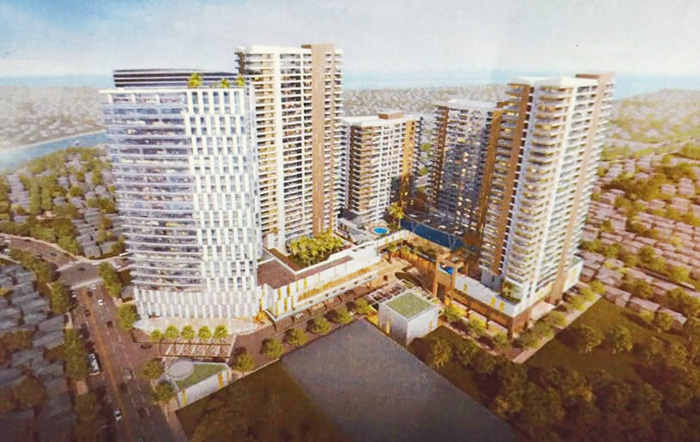 YHES, Inc. will embark on a mixed-use development project which will soon be tagged as Davao's biggest landmark. Present during the agreement signing were joint venture partners, CLI represented by their CEO, Mr. Jose Soberano III, Yuson Strategic Holdings Inc. represented by Fredrick Yuson and Davao Filandia Realty Corporation represented by Jason Huang. Mr. Jose Soberano, III, President and CEO of Cebu Landmasters, Inc.
Mr. Fredrick Yuson, President and CEO of Yuson Strategic Holdings Inc.
On November 10, 2017 at Aposento Davao, Matina I.T. Park, Davao City. 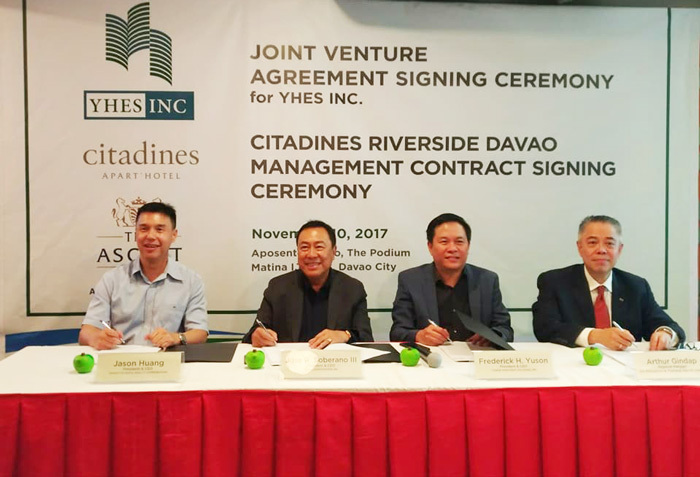 “Davao City is my hometown and I am honoured to partner with Jason Huang and Cebu-based real estate giant CLI in developing what will become one of Davao’s biggest landmark,” said Yuson Strategic Holding President and CEO, Frederick Yuson. “I am very excited to be part of this new venture. This latest project will stand in a 1.9-hectare property along McArthur Highway in Matina, Davao City,” said Davao Filandia Realty Corporation President and CEO, Jason Huang. The project will host residential units, retail shops, office spaces and the highly-rated hotel brand, Citadines. On the same event, CLI also entered into Service Management Agreement with The Ascott Limited for Citadines Riverside Davao. This will be the flagship brand of this development. There will be at least 250 units and half of which will be developed into serviced apartments with international standards. Half will be up for sale to individual and corporate buyers. Citadines Riverside Davao, an exclusive serviced apartments with spacious and luxurious accommodation, will offer short and long-stays to guests. An Ascott personalized service trademark will be provided to every guests on board. Personal concierge of guests staying in the property will be available even prior to their stay at the property. “We are very happy to partner with CLI in its second Citadines and The Ascott Limited’s first in Davao. CLI’s first Citadines is in Baseline Center and also The Ascott Limited’s first in Cebu City,” said Arthur G. Gindap, The Ascott Limited’s Regional General Manager for Philippines and Thailand. “Together with our joint venture and management partners, we are committed to bring a modern and comfortable city lifestyle to Davao City, providing Davaoenos everything they need in one venue,” said CLI Chairman and CEO Jose R. Soberano III. This is CLI’s second development project in Davao City after it launched Mesatierra Garden Residences, a 22-storey residential condominium under YES, Inc. joint venture. CLI is also gearing up to develop its third and fourth project in the coming months here in the city.